Cafe' Du Monde Coffee & Chicory, 15 oz. 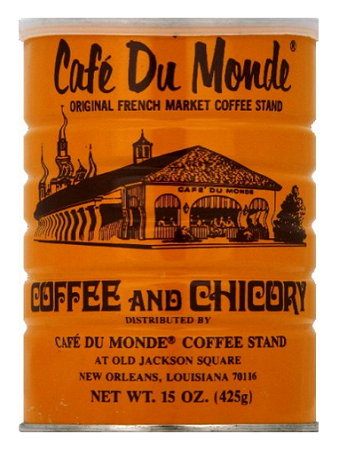 Home > New Orleans Drinks > Cafe' Du Monde Coffee & Chicory, 15 oz. This is the exclusive Cafe' Du Monde Coffee and Chicory coffee blend served at all Cafe' Du Monde coffee stands in New Orleans. This coffee and chicory blend has a nice rich bold flavor that pairs well with their Cafe' Du Monde hot beignets. Want to try a New Orleans twist on your coffee experience? Try making a Cafe' Du Monde cafe' au lait. Use 1/2 cup Cafe' Du Monde Coffee and Chicory coffee brew and 1/2 a cup of hot milk. Then add sugar to taste.